A file photo of SpaceX's Falcon 9 rocket on the launch pad. SpaceX has delayed the launch of a Thai communications satellite from Friday until at least Monday, according to the U.S. Air Force. "We're not aware of anything that would cause a mission failure, but in order to ensure the highest possible level of mission assurance we decided to conduct additional inspections of the launch vehicle," said Emily Shanklin, a SpaceX spokesperson. The mission patch for SpaceX's Falcon 9 rocket launch carrying the Thaicom 6 communications satellite in January 2013. Backup launch opportunities are available from Jan. 8 to Jan. 12. 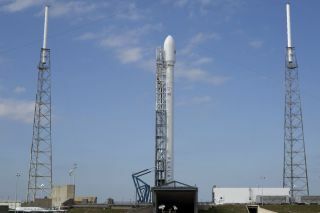 A launch would not be possible Tuesday because the SpaceX mission shares a tracking station in Bermuda with the Orbital Sciences Corp. Antares rocket set for launch from the Wallops Flight Facility in Virginia on a resupply flight to the International Space Station. The Falcon 9 rocket is slated to loft the Thaicom 6 communications satellite into a high-altitude egg-shaped supersynchronous transfer orbit. The satellite, built by Orbital Sciences Corp., will provide broadcasters in the Asia-Pacific with improved television quality and additional high-definition channels, according to Thaicom. It carries 18 C-band and eight Ku-band transponders connected to three antennas. SpaceX worked over the holidays to ready the Falcon 9 launch pad after the company's successful Dec. 3 launch of the SES 8 television broadcasting satellite, marking the Falcon 9's first mission to geostationary transfer orbit, the desired position for most communications spacecraft. The launch of Thaicom 6 will duplicate the Dec. 3 flight, sending the 3.6-ton satellite to an orbit stretching more than 50,000 miles from Earth at its highest point. The mission will take about a half-hour from launch to spacecraft separation. It will mark the eighth flight of a Falcon 9 rocket since 2010, and the third launch of the launcher's newest version since its debut in September in a flight from Vandenberg Air Force Base in California. Hardware for Friday's launch, including the Falcon 9 rocket and Thaicom 6 satellite, was delivered to Cape Canaveral in late November and put in storage before the launch of SES 8 cleared room for technicians to begin fueling the spacecraft and assembling the two-stage booster. On Dec. 28, ground crews put the rocket through a full countdown rehearsal. The launch team loaded propellants into the Falcon 9 rocket and ended the countdown with a brief ignition of the first stage's nine main engines. The rocket remained on the launch pad in the grip of hold-down clamps. Technicians this week were expected to connect ordnance charges responsible for staging and fairing separation during the Falcon 9's ascent into orbit Friday evening. This week's milestones were also supposed to include the encapsulation of Thaicom 6 inside the Falcon 9's payload fairing and attachment of the spacecraft and fairing to the Falcon 9 rocket. See Spaceflight Now's Mission Status Center for coverage of the Thaicom 6 satellite launch.